DETROIT, July 9, 2018 /PRNewswire/ -- Points of Light, the world's largest organization dedicated to volunteer service, announced that DTE Energy has been named among the organization's Civic 50 -- the top 50 companies nationally in corporate citizenship. DTE Energy was the only Michigan company to be awarded this prestigious honor and was also acknowledged as the leading energy company nationally. The announcement was made at the Service Unites 2018, Points of Light's annual conference on Tuesday, June 19 in Atlanta, where leaders from across the country gathered to discuss social innovation, civic engagement and cross-sector collaboration. "DTE Energy is passionate about being a Force for Growth in the communities where we live and serve, and this national award validates our efforts as we continue to make an impact through our work," said Nancy Moody, vice president of public affairs at DTE Energy. "We recognize our role and the opportunity we have to lead as a corporate citizen who cares about its customers and look forward to building on our momentum for years to come." The Civic 50 honorees are public and private companies with U.S. operations and revenues of $1 billion or more, and are selected based on four dimensions of their U.S. community engagement program including investment, integration, institutionalization and impact. "The Civic 50 truly highlights the commitment of community and civic engagement of America's leading brands," said Natalye Paquin, president and CEO, Points of Light. "Points of Light highlights the people that people drive change in addressing society's growing and most profound challenges. The business community plays an important role in creating and delivering innovative solutions that drive social good in the communities where they live and work." The Civic 50 survey was administered by True Impact, a company specializing in helping organizations maximize and measure their social and business value. The survey instrument consists of quantitative and multiple-choice questions that inform The Civic 50 scoring process. The Civic 50 is the only survey and ranking system that exclusively measures corporate involvement in communities. 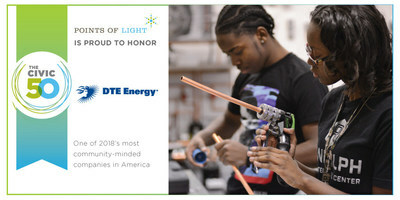 To learn more about DTE Energy's work to be a force for growth, visit DTEImpact.com.